the riders are bold, and they have a blast. who show their appreciation with cheers so loud. from the East coast to the West! 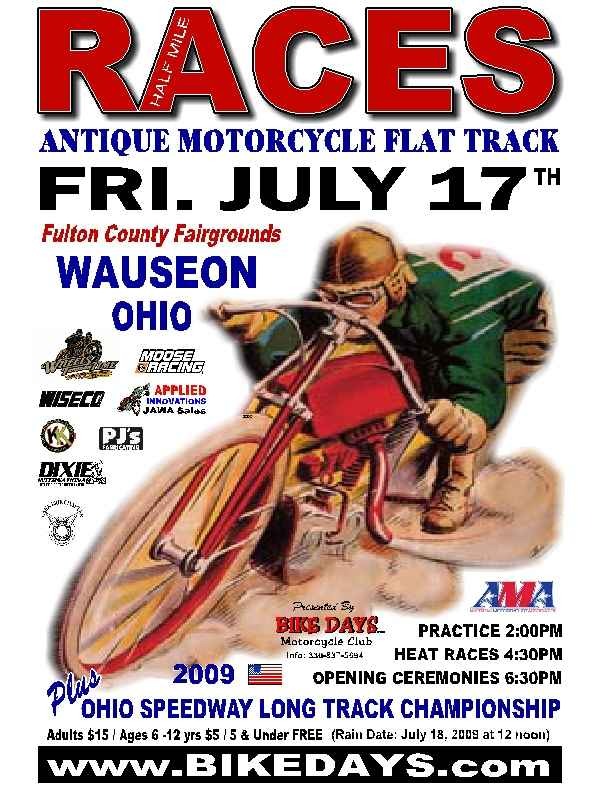 The second annual Wauseon, Ohio vintage motorcycle race was a tremendous success with a full grandstand, full grids of antique boardtrackers, handshifters, brakeless vintage, and speedway motorcycles. The races, promoted by Scotty Brown, were held in conjunction with the Antique Motorcycle Club of America national meet at the quaint Fulton County Fairgrounds, west of Toledo. Repeat winners from the inaugural 2007 race were Chad Rall in the 500cc footshift and Pro Twins classes, Doug Horner in the Handshift class, and Patrick Murphy in the Boardtracker class. Even the 165cc lightweight class produced excitement for the packed grandstand as grandmother Linda Blum passed 2007 winner Mike Magee at the checkered flag for the win on her Harley Hummer. The fastest racing of the day was provided by the long-track speedway riders in their six heats building up to the state of Ohio Speedway Championship event, won by Chad Rall, son of legendary rider Ronnie Rall. Chad claimed the title by besting Chris Thomas and Dan Weicht in the A Main final. Vintage racing seems to be a growing family affair as David Weicht, Dan’s brother, won the Speedway B Main. Other father-son winners included Rich Long in the Vintage 250/360 class and Aaron Long in the Open Amateur Vintage Class. And Nate “Bubba” Long took third in the Pro Twins class. Next up are the August 29 Davenport, Iowa vintage races, held in conjunction with the AMCA’s Chief Blackhawk Meet August 29-31.